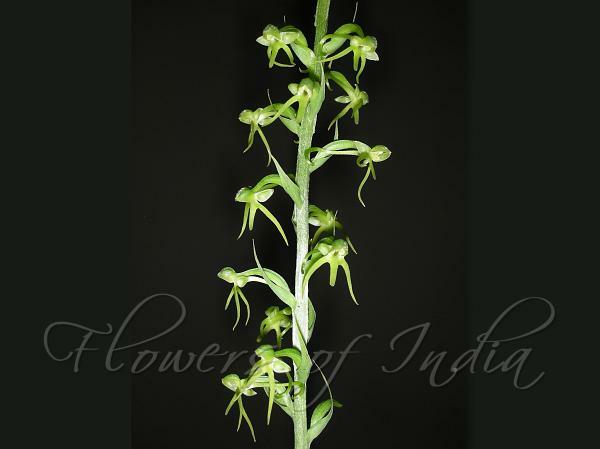 Forked Habenaria is a terestrial orchid, 1-2 ft tall. Stem is sheathed in lower part, with 3-6, large, elliptic, acute, up to 15x5 cm leaves, crowded below the middle, above with appressed linear-lanceolate sheaths. Inflorescence is 12-30 cm long, narrowly cylindrical, rather lax. Bracts are lanceolate-long-pointed, as long as ovary. Flowers are green, sepals nearly equal in length, the dorsal one ovate-oblong, concave, 5 mm long, the lateral sepals falcately oblong, usually slightly longer. Petals are oblong, blunt, 5-6 x 2 mm. Lip is parted in three, with threadlike side-lobes, slightly diverging, 9 x 1 mm, longer than the straight, narrow- lanceshaped mid-lobe. Spur is slender, longer than ovary, 2 cm, narrow- cylindrical, prominently widened at base. 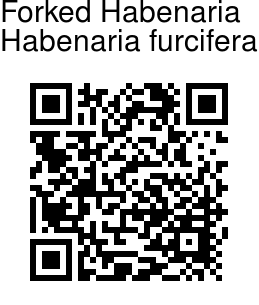 Forked Habenaria is found in the region from NW Himalayas to Sikkim, Bhutan and Assam, at lower altitudes, 150-1800 m, and in Western Ghats. Flowering: July-August. Photographed in Sirmaur Distt, Himachal Pradesh & Maharashtra.